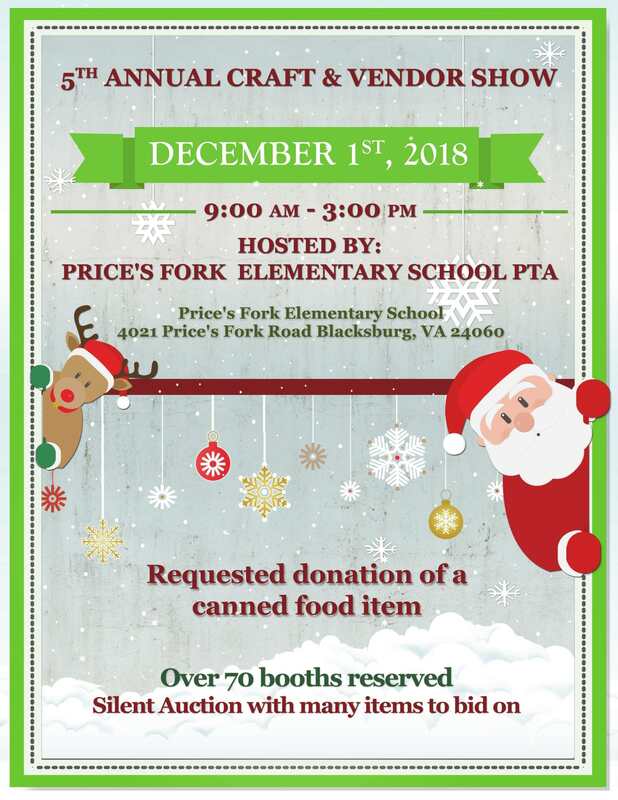 Prices Fork Elementary School PTA presents the 5th Annual Craft & Vendor Show on Saturday, December 1, 2018 at Prices Fork Elementary School. Shop and browse over 70 vendor booths reserved by crafters, vendors and more and there will also be a silent auction with many items to bid on. Admission is free. Attendees are requested to bring a donation of a canned food item. Prices Fork Elementary School is located at 4021 Prices Fork Road in Blacksburg, VA.
To view the event flyer, visit: https://i.imgur.com/8DZxzNu.jpg. For more information, visit: https://sites.google.com/a/mcps.org/pfes-pta/home/craft-show or call: 540-951-5834.